Here are some cool and fun shots that the Carriage House B&B‘s own photographer, Tom, took this weekend at the Boo Benefit Rally. The dates for the 2012 Boo Benefit are October 12-14, 2012. 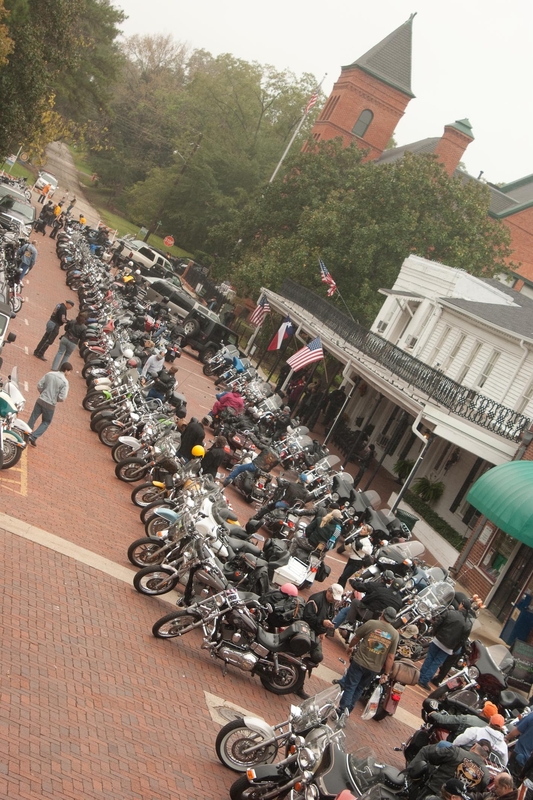 The Carriage House Bed & Breakfast will begin taking reservations for the 2012 event this coming Monday, 10/9/11. Check out this awesome video to better understand the mission of the Boo Benefit. It started on Thursday. In the distance, you could hear the low rumble of the Harley’s rolling into town. Plat. Plat. Plat. On the highways, you could see the caravans of RVs progressing their way into Jefferson. There was a sense of excitement in the cold damp October air. It was clear that this was going to be a different kind of weekend. It was clear that it was the Boo Benefit. There have been no official numbers released yet on attendance or on the amount of money raised, but the Marion County Chamber of Commerce has said that the event had a larger attendance then 2008. Potentially there were upwards of 40,000 people and their bikes in town for the benefit. This was a sturdy crowd. They didn’t let the miserable weather keep them from the rally. The first rider went out at 10am on Saturday for one of two courses. It was an all day ride and people didn’t start coming back in until late afternoon. Many of the riders said that the cold cut through their chaps and the rain pelted them like nails. However, they were here to support Boo and they were determined to ride for the cause. The Carriage House was full. Our guests started showing up early Friday afternoon. Some rode in but most everybody trailered their bikes. On Saturday, Tom made his “Almost World Famous Chili” to help keep everyone warm. Dixie and Samantha made a host of new Best Friends and Dixie even tried to go home with the crew out of Jacksonville (I think they would have taken her too). Everyone had a blast. It was a fun and fantastic weekend. We are already booked for next year but if you would like to go on the wait list, please call us at (903) 665-9511. Next weekend is the 12th annual Boo Benefit. It is going to be a loud and rowdy time here in Jefferson. I have been told by several people that there could be upwards of 50,000 people descending on this small town next weekend. Here at The Carriage House, we are busy preparing for a very busy weekend! Boo Benefit started twelve years ago when a gentleman by the name of Boo (Charles “Boo” Chaler) was burned over 95% of his body in a welding accident. Boo was know for his love of riding and his friends and fellow riders created the Boo Benefit to help pay his hospital bills while he was still in the burn unit of the LSU Burn Unit in Shreveport, LA. Today this worthy event, helps support the Camp I’m Still Me (formally the Louisiana Burn Camp) and gives thse young burn survivors the opportunity to go to camp and have fun just like any other youngster. So if you like to ride, come on down next weekend to support a great cause and have fun at the same time.